Why should we care about social selling? Isn’t it just another one of those buzzwords used to describe something we already know about? Isn’t it just sales under a different name? If that’s true then why are we seeing organisations increasingly using new digital channels as part of their sales strategy? Maybe it’s because engaging with our audiences in new ways is just more exciting than traditional sales channels as it provides a way of interacting with our potential buyers. It’s also because it’s a lot cheaper, digital channels allow us to reach a wider audience, with the same resources. We’re having a look at who is the most influential in this up and coming topic, and figuring out what brands are driving most engagement on social media. Customer relationship management software is big business and CRM brands are starting to integrate social selling into their packages. In the analysis we can find brands like Pipeliner and Nimble in the true CRM space and more complete solutions like Hubspot and Salesforce also join the party. Next to the big boys we can also find solutions like Socedo and PeopleLinx, which are tools that feature high social media integration and are really focused on social selling/ prospecting. Furthermore, combined with the classic CRM and social selling players we also find a good number of blogs and publications on the subject, ranging from the classic business2community to more specialised twitter handles like Social Selling News. Social selling is definitely here to stay as you can see below on the Google Search Trends graph. We have seen a very engaged community around the topic and this is only set to increase in the coming year, old sales techniques are dying and its great to see the use of “new” channels in sales. Below you can see a network map of the debate and we were surprised to see such an engaged community of individuals. We captured data from around 33,000 users and the top 100 individuals (in red) were all extremely interactive with each other. Be sure to click on the map to enjoy the full size network map. A high quality version is also included in the full report, that you can download by clicking the green button below! 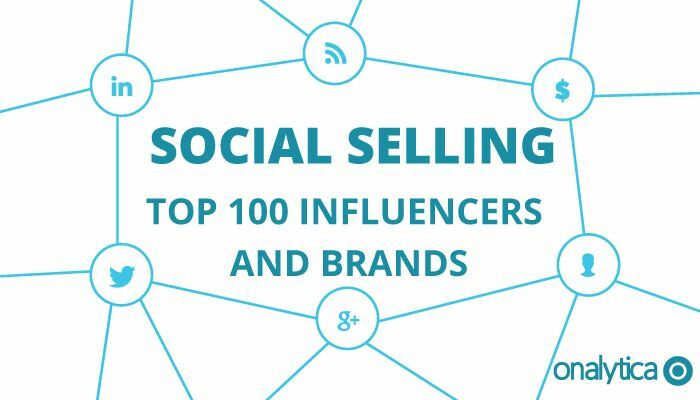 We looked at all the individuals engaging in the social selling discussion to give you the Top 50 influencers in the social selling landscape. Be sure to hit one of the green buttons to download the full top 100 brands and individuals for free, including detailed network map to better understand the debate. LinkedIn for sales tops our list and we are not surprised, in our opinion LinkedIn remains one of the best platforms designed for social selling. Hubspot and Salesforce are also engaged in the community and are joined by smaller CRM players like Nimble and Pipeliner. We also find a number of blogs, like socialmediatoday and MarketingLand to name a few. Be sure to download the full analysis for free to get an idea of who are most influential brands in the social selling debate. At Onalytica we love building these lists and want to give back to our loyal readers as much as we can. If you’re interested in other topics (such as Content Marketing , Wearables, Machine to Machine …) be sure to have a gander on our blog or why not propose some topics to us on twitter? We also build some very cool software to manage all of these influencers. Get a free demo and learn more right here!